Klassroom has the sole vision of empowering children with easy access to quality education. It is an aggregator of local institutes bringing them under one umbrella. Klassroom is one of India’s fastest growing brands in the edutech space, with over 135 franchisees already! 3 Minds Digital has been associated with klassroom since their inception and has helped them with their branding, brand strategy, visual architecture, social media marketing, and digital marketing initiatives. 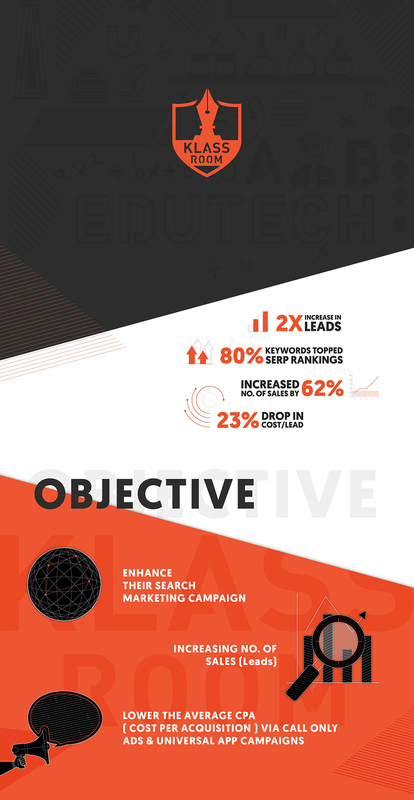 As klassroom was new in the education industry 2 years back, it required an aggressive push and pull marketing in the digital space. Numerous marketing efforts were initiated for the brand by 3 Minds Digital. Due to these marketing strategies Klassroom already holds 135 centers across Mumbai within a short span of 2 years. 3 Minds Digital also engaged with Klassroom on WhatsApp Marketing & SMS marketing initiatives to generate relevant leads. Various interesting social media marketing initiatives too were undertaken to generate leads on regular bases. Target location-specific Google Ads(Call only) campaigns were also run. These continuous efforts of 2 Years yielded great results, and have had a direct impact on the brands tremendous growth. We are already in line with helping them move towards their aim of having 500+ Klassroom centers pan India by 2020.